In February of 1981, only three years after being named as the successor of St. Peter, Pope John Paul II visited Anchorage. Approximately 65,000 Catholics and non-Catholics alike traveled from across the state to be in the presence of this extraordinary man – the former Cardinal Karol Wojtyła from Poland– and to receive his blessing. 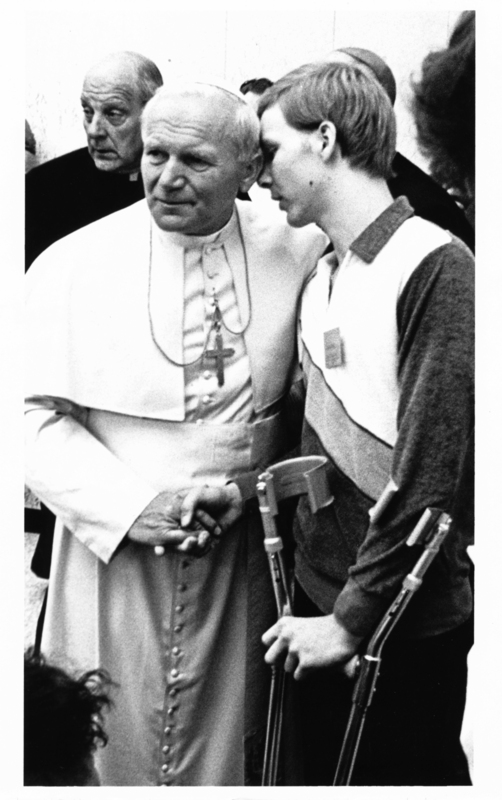 In the remaining years of his pontificate, he grew to become a great ‘model of holiness’ to many, particularly in how he bore the suffering brought on by Parkinson’s disease later in his life. Young Juneauite Carroll John Holst – better known by his nickname, Caje – was among the many to travel to Anchorage for the Pope’s visit. Fr. 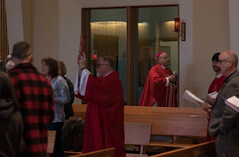 James Manske, then pastor of the Cathedral of the Nativity of the Blessed Virgin Mary in Juneau and close friend of both Caje and his family, made a point of securing the inspiring teenager an invitation to a private audience with Pope John Paul II. Caje, a high school senior and athlete, had been diagnosed with bone cancer two years earlier at age 15, losing first one leg, and eventually the other to the disease. Though initially given six months to live, Caje persevered, inspiring others with his positive attitude, sense of humor, and exceptional athletic ability. A private moment – Pope John Paul II (Karol Wojtyła) and Caje (Carroll John) Holst of Juneau share a private conversation during the Pope’s visit with exceptional people in the cathedral basement in Anchorage, Alaska on Feb. 26, 1981. Photo courtesy of Mark Kelley/Juneau Empire, Feb. 1981 Inside Passage. 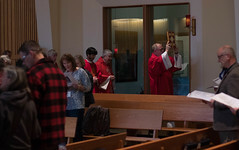 His mother, Janice Holst, recalls that the Pope met with a group of disabled Alaskans in the basement of the Holy Family Cathedral in Anchorage, and Caje was invited to attend. Although she wasn’t able to be in the room, Janice was told that after the Pope gave his blessing to the group, he looked across the room at Caje and walked directly over to him, put his arm around him, and spoke to him privately. Caje never related what was said in the exchange with Pope John Paul II, but Janice suspects that their both being named Carroll/Karol and both being of Polish descent might have been a factor. Caje went on to survive years of chemotherapy, radiation and experimental neutron treatment. He and his mother and father became known throughout Alaska in the 1980s for their dedicated fundraising efforts on behalf of cancer research. Caje died in 2006 from complications caused by the experimental cancer treatments, 27 years after he was given his six-month diagnosis, and after having lived a full life, marrying and fathering two daughters. “He was very brave, he never felt sorry for himself,” Janice Holst related in a 2013 Juneau Empire interview.